When it comes to emptying a water tanker in a hurry, the Newton Kwik-Dump Water Valve has meant quality construction and trusted performance for almost 50 years. The first large opening, fast flow water valve was introduced by A.H. Stock Mfg. as the model 1010. All 1010 styled valves have been designed with a plunger style back plate. The model 1010 outperformed anything available at the time; it ultimately set the standard for all future dump valves. The model 1050 Newton Kwik-Dump Valve, and all 1050 styled valves have been designed with a gate style back plate which moves completely out of the way for improved water flow. 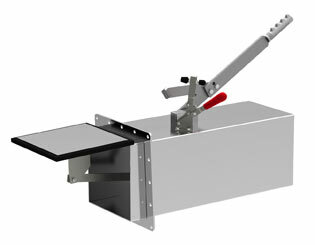 The model 1050 can dump over 3,500 gallons of water per minute - under ideal conditions. All standard Newton Kwik Dump Water Valves are 10” x 10” x 24” and are constructed so all parts constantly in contact with water are made of stainless steel, brass, or rubber. 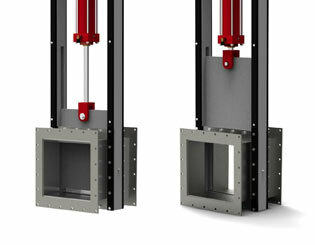 All valves are available in mild or stainless steel and can be customized to accommodate your unique specifications. We offer a wide array of options including chutes, paint & length options, and handle variations to suit your specific dumping needs. Newton Kwik-Dump Valves should be a part of every new tanker in your plans, and they can be readily adapted to trucks already in use. Instructions and templates are furnished with all Newton Kwik-Dump Valves. The original 1010 Newton Kwik-Dump Valve, and all Valves thru the model 1046A, are designed with a plunger-styled back plate which pushes straight into the tank.The 1010 styled valves are preferred when working in conjunction with a sump style tank. All Newton Kwik-Dump Valves are shown below in stainless steel, and are also available in mild steel. Please see the accessories section for a sample of the many items we offer to compliment your specific dumping needs. Valves come standard with a 2-degree angled flange; squared flanges available upon request. Please specify tank style when ordering. Utilizing our expertise, along with that of local dairy farmers and municipal waste haulers, we have developed a 12 inch square Knife Valve. 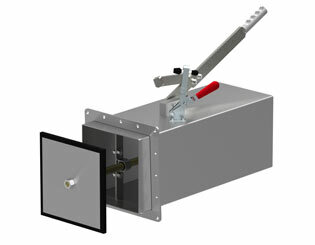 This valve is designed to shear off any foreign objects that may obstruct the seal area preventing leaks. In conjunction with development, the same group tested the Knife Valve under various conditions ranging from sawdust, straw and sand bedding to municipal waste with excellent results.